Welcome to villa La Casa Azul! 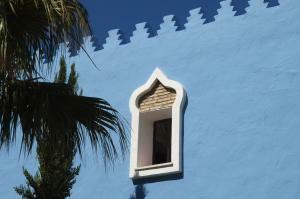 This unique blue Moorish-style villa accommodates eight people and is located directly on the beautiful beaches of the Costa de la Luz. This 'Coast of Light' with its wide natural beaches, authentic fishing villages and ancient Moorish white villages in the mountains of the hinterland is typical of Spain's most beautiful province: Andalusië. Het fishing village of Zahara de Los Atunes where the villa is located is a perfect starting place for example a day trip to Ronda, Seville, Bolonia, Tarifa or Vejer de la Frontera, but also a great place to just relax on the beach or on the patio with a good book and a glass of sangria. La Casa Azul has three floors and is located in an architecturally beautiful complex with villas in different designs and colors at 50 meters away from a beautiful beach where it is safe swimming and surfing. 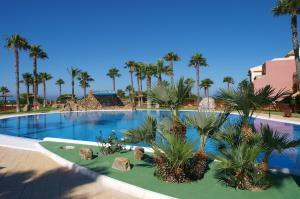 Near the villa is a well-maintained pool with professional supervision and a children's pool. Its location right on the coast and the fresh breeze is never unbearably hot here, even the height of summer. Additional Information: The house gives two mobile air conditioners , which are in the bedrooms. If desired, you can move the air conditioners. Upon arrival the English speaking caretaker will provide you with the key's to the house including the remote for the automatic gates to the garage under the house. In the house you will find a practical guestbook full of tips, hints and ideas for daytrips and 'must sees'. 5/ The nature reserve past Barbate including a visit to the old pigeon hacienda La Briena halfway for excellent coffee/teas. Shopping: Two small supermarkets and bakery,in season, within walking distance. Various shops, boutiques, restaurants and supermarkets in Zahara itself. 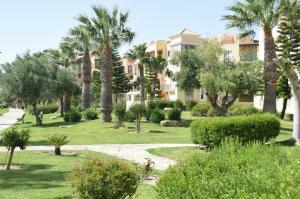 Two large supermarkets, including a Lidl, and petrol stations in Barbate ( 10 minute drive ).